Join the discussion on our forums! Come discuss Happy Ghoul over in our dedicated Happy Ghoul discussion topic. 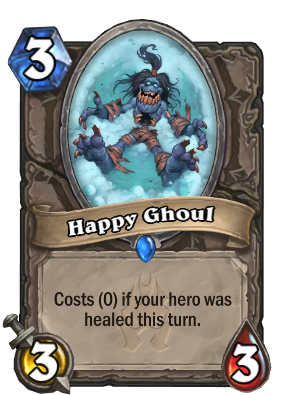 Costs (0) if your hero was healed this turn. It's time to nerf the Ghoul. Change it from a 3 mana 3/3 to a 2 mana 2/2. It's too strong for Warlocks. It's crazy how powerful anything can become if you are able to play it for free. Tempo is king once again. If you are full hp, discount wont trigger. Learned that the hard way. What other effect similar to this works when you "heal" for 0? Northshire Cleric would be OP if it worked like that. I think if there's anything that's gonna bring back control warlock it's this card in combo with farseer or Drain Soul. Or, you know.. Flame Imp + The Coin + Flame Imp and you wouldn't have to run a Voodoo Doctor in your deck. so you would rather take 6/4 worth of stats in 2 minions in turn 1 that deals 6 damage to own face rather than 11/6 worth of stats in 4 minions deal 1 damage to your face? yeah i know late, i hope this doesn't count as grave-digging. After Call in the Finishers, Finja, the Flying Star and now this, I am 100% certain some Blizzard artists have foot fetishes. Going for the Tarantino crowd. What kind of drugs hes on. What makes this ghoul happy?